Have you seen Game of Thrones and felt the urge to fight as deftly as Arya Stark? Or perhaps you have watched re-runs of the Princess Bride and been inspired by Inigo Montoya’s flamboyance and flair? With rapier hand, darting with grace and dexterity, clashing against the weapon of your enemies, you may enjoy renaissance fencing in the SCA. We study, replicate and compete with styles of rapier sword-fighting found in Europe during the Renaissance period, using blunted steel swords and a variety of off-hand defensive items. 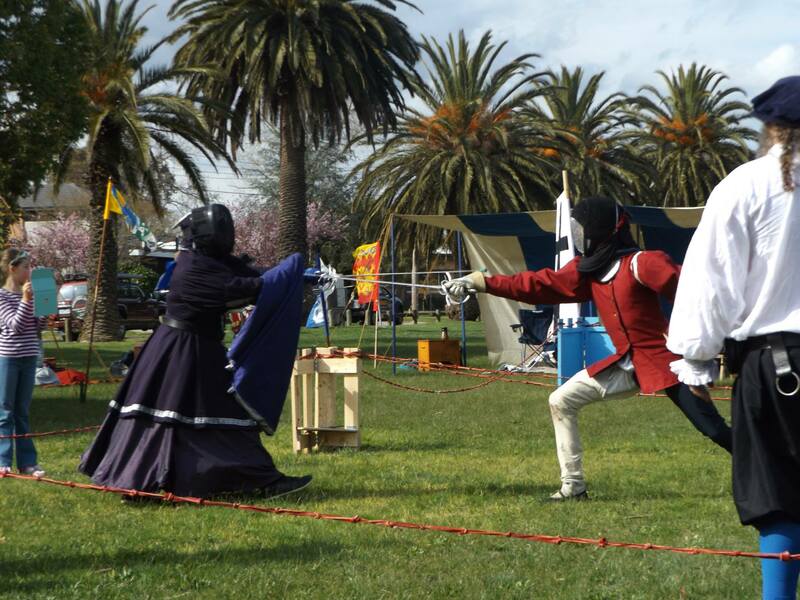 We wear pre-17th century clothing while competing, along with, or incorporating protective equipment (such as modern fencing masks) for safety. There is also a sub-community dedicated to supporting the research and teaching of the period martial arts of Europe as detailed in the various extant fencing and wrestling manuals. There are minimum standards for armour and weapons, but as a general rule, you must have sufficient protection for your head and neck (fencing mask and gorget), body armour, hand protection, and groin protection. In addition to a primary sword (rapier, longsword or single bladed weapons, such as a szabla or scimitar), combatants are permitted to use an additional item in their off-hand. These include a parrying dagger, shield or buckler, cloak or other flexible item, a cane, stick, or second sword. Our weekly rapier training session is where those interested in Rapier get together to practice and hone their skills, held every Thursday night from 7-9pm, subject to venue availability. For inquiries about this activity, please contact the Rapier Marshal.